Th e provision of finance to small, entrepreneurial firms is a vital element of any dynamic economy. Such businesses constitute one of the traditional links between radical innovation and economic development, yet they are also unusually susceptible to market failure. Many years ago, when much of my teaching was in the area of finance, I faced the challenge of how best to help students understand the relevant issues. At the time I was involved in a significant survey of SMEs and their attitudes to banks, which meant I could at least use data to bolster the confrontation with theory. I set about demonstrating the difference in mindsets between those seeking finance and those tasked with bestowing or refusing it. I also called on entrepreneurs and bankers to offer what I thought would be valuable insights. And yet I was never convinced that my students came close to feeling immersed in the process of financing novel and previously unknown ideas. It was only as my own focus shifted more towards radical innovation and creative problem-solving that I started to make sense of the situation. Everything has a before, a during and an after, and my efforts to enlighten my students had been too firmly rooted in just one of these. The imagination and invention that precede a new business start-up – the before – had been overlooked; similarly, the many hurdles that remain to be leapt once financing has been secured – the after – had been ignored. The narrowness of such an approach becomes almost embarrassingly apparent if we search for analogies in fields of study more familiar to the masses. Consider, for instance, a history module that covers World War Two with no reference whatsoever to causes or repercussions: no mention of Hitler’s rise to power, no discussion of the emergence of Italian fascism or the growth of militarism in Japan, no analysis of the consequent fates of competing empires – just a self-contained, strictly fettered trawl through the events of September 1 1939 to September 2 1945. Viewed in this deservedly unflattering light, my attempts to explain the provision of finance to small, entrepreneurial firms begin to look somewhat inadequate. And so they were. 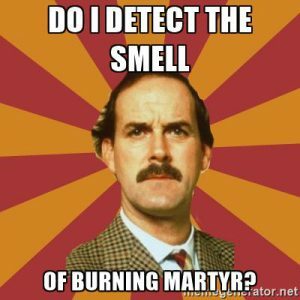 I draw on them here in the spirit of fairness and guilt (as Basil Fawlty remarked: “Do I detect the smell of burning martyr?”) and because doing so makes it just a little easier for me to suggest that the very same shortcomings, unhappily, are still rife in the sphere of enterprise education. It is useful, I believe, to think of this in terms of “learning velocity”. This is a concept of which I have become quite fond, notwithstanding that another piece of jargon is among the last things business schools require at a time when debates about teaching and learning are rightly leaning towards greater clarity and transparency. Learning velocity refers to both speed and direction – the pace at which students learn and the outcomes, good or bad, that result. For our purposes here – and in keeping with my earlier post ­about the crucial difference between “know-about” and “know-how” – we might translate the term into a question: how rapidly are our students nearing the point at which they have the skills necessary for life after graduation? Ideally, every aspect of a curriculum would ready students for what awaits them when they leave university. There would be no gap between what they learn and what they go on to discover. This would produce an optimal learning velocity of one. If a curriculum were to bear no relation to students’ ability to survive in the “real word”, as is too frequently the case, learning velocity would be zero; and if a curriculum were actively to reduce that ability, as sometimes also happens, learning velocity would be negative. This brings me to what I hope will be taken as a helpful illustration rather than as a self-regarding statement of belated personal vindication. In 2000 my colleagues and I redesigned the entrepreneurship module at Nottingham University Business School. Our objective was to provide a before, a during and an after and to immerse our students in all three. With this aim in mind, we invited students to create, finance and market their own brainchildren – to assess the opportunities available, to zero in on those seemingly most viable, to try to raise funding and to sell to the community. We were well aware that few would succeed, but we also knew that recognition of failure would itself deliver a valuable lesson. We wanted their learning to be profoundly experiential and to close as fully as possible the chasm between what we taught them and what they would find when they left us to embark on their careers. I do not pretend that we achieved a learning velocity of one. I have long favoured an outlook that borrows from the Austrian-influenced philosophy of economics, which accepts that perfection is impossible. I am sure no module, course or curriculum will ever be able to prepare the entrepreneurs of the future for each and every eventuality they might encounter in business. But I do think that in our case learning velocity increased substantially for all concerned. Maybe the ultimate lesson is that short-termism and incomplete frames of reference are justifiable only very rarely. They may be defensible – even appropriate – when technological and market conditions are relatively stable and predictable, but they fall far short of what is required when change is endemic and accelerating. We live in an age of uncertainty. Moreover, the next generation of entrepreneurs can expect to find themselves in an age more uncertain still. We have to acknowledge that this alone demands a much broader sweep of understanding – one that extends beyond the relative sureties of the present to encompass both what has gone before and what may yet come.